Here is the player's book The Cursed RPG Player's Book. Here is the GM's book The Cursed RPG Gm's Book. A few extras for the players Players Section. More about my group Group Bios. Links for suggested reading and watching Referance page. My blog. I do not usually think to update things like this often, but if I have something to say and think to update it I will. Blog. The Cursed RPG. A New, Free RPG. Throughout history they have been called many things. Shamans, medicine men, wise women, witches, wizards, sorcerers, profits, heretics, the Cursed. The world of the Cursed is the same as our world, the streets are the same, the stores are the same, it�s the characters that are different. The characters were normal once, then they received "the gift." The gift is the ability to sense beyond the normal into the realm of the supernatural. Some can see the world of spirits, others escaped the other world, while some spent years learning control and alter the natural laws. 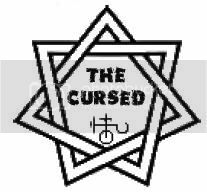 The Cursed RPG is a low powered urban fantasy game. Magic isn't real, there are no vampires or werewolves, and here not be monsters. Well, that is what the mass majority want to believe at least. Your character is one of the unfortunate ones who get to learn the truth the hard way. While you play someone capable of wielding great mystical powers, it isn't as good as it sounds. Your character may be more powerful than his mortal ken, he is still the lowest man on the supernatural ladder. Just a few things to keep in mind while reading and playing the Cursed RPG. First off, I am lazy. I use the masculine form of pronouns because, in general, it is one less letter to type. Also, please keep in mind I am Canadian, so if something looks like it is spelled wrong, there is a chance it is just the Canadian spelling of the word (though there is a better chance I just spelled it wrong). I sometimes switch between Canadian and American spelling, but that is mainly because my spell checker seems to like to switch from one to the other randomly. Also, most measurements are in metric and then imperial units. The conversion is only rough, just to give a general idea. I now have some variant classes and extra bonuses and penalties for the player's section online. I hope you enjoy. Please e-mail me any edits, comments, and/or suggestions at thecursedrpg@gmail.com. *Note* July 19, 2010. I have a rough copy of my first supplement for The Cursed RPG finished. It is called Cursed of the Walking Dead. It can be downloaded here. Please give me your feedback at thecursedrpg@gmail.com. *Note* December 21, 2012. To celebrate the end of the world I am putting up an updated, poorly edited version of Cursed of the Walking Dead. The major change is that there is a chance for the Cursed to become zombies. *Note* February 9, 2013. I was talked into putting the website onto Google sites rather than Angel Fire. I compromised, I have it on both. The google site page needs to be prettied up some, and it only has the main books and the character sheet on it for now, but I a link to the new site on the side. Feb 13, 2013. I put up a slightly updated Player's book with firearm rules. The update section is where I will put random updates when I get them to put up. Sometimes mine and sometimes other people's. For instance, The summoning is a short story by Samuel Metson, and was added on Sept. 20, 2013. he e-mailed me a short time ago with a second source book for the Cursed RPG and I hope to have it up on the site soon, depending on what the writer would like to do with it. Note that the rune magic bonuses in the updates section has also been added to the extra bonuses in the players section. I want to start wide spread open play testing on The Cursed RPG. I am planning on spamming this site to every forum and Facebook page (or at least a few)to get people to play test (and hopefully help edit) the game. I am also getting ready to play test a new game I made. I also want to do a new source book for The Cursed RPG about secret societies. If you have a favorite secret society please email me about it. Another thing I updated was Cursed of the Walking Dead. I added secret societies to the GM section. *Note*Great news, I am posting the second supplement for the Cursed RPG. This one was written by Samuel Metson. It is well written and a great addition to the Cursed family. Please give it a try and send an comments to me and I will see that he gets them. *Note*More great news, I have more Cursed RPG content from Samuel Metson. This time it is a variant sorcerer class, the Vancian Caster. It can be found in the player's section of this site. So, without farther ado, please enjoy my game.